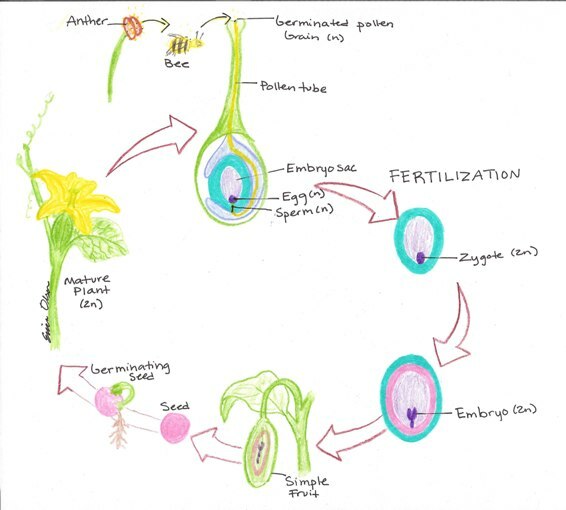 Before we are able to talk about the life cycle of the angiospem, we must first understand its structure of its flower. Below is an image depicting a one type of monoecious flower (containing both male and female reproductive structures within one flower). The structures included are the sepal, petals, stamens and carpels all attached to the receptacle, a portion of the stem. The stamens are the male reproductive organs and the carpels are the females. The sepals are responsible for protecting the floral bud before it opens by enclosing it. The petals bright colors are used to attract pollinators, bees in the case of the cucumber, although other pollinators include humming birds and butterflies. The stamen consists of the anther and the filament. The anther are the structures that produce pollen. The carpel consists of the ovary, the style and stigma. 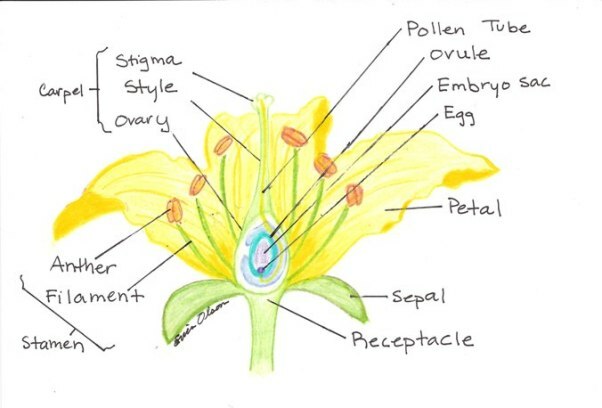 The stigma is the structure that receives the pollen and carries it down the pollen tube to the ovary. Like the flower above, the cucumbers flowers are also monoeicious, but because both male and female flowers are on the same plant. Unique to the angiospem life cycle is the formation of fruit. 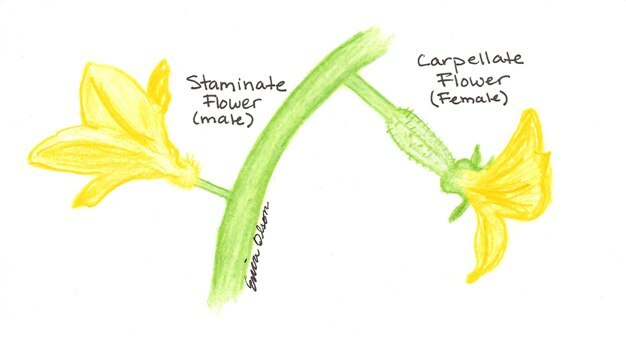 Seen below is an image of how the female flower, fertilized by the pollen on the bee from the male flower, is able to produce a cucumber. Observe that the egg, which is haploid(n) is fertilized by the sperm with is also haploid(n) combine to form a diploid(2n) zygote. The final result is the formation of the ovary protecting the seeds which is the fruit that we eat. To learn more about interactions with other organisms click here.